Madison's 1950's Esquire wiring harness. Reproduction .05 Capacitors. NOS 3.3 k Allen Bradley resistor. Our harnesses are wired using CTS 250k Solid shaft potentiomenters, CRL Switches and Switchcraft input jacks. These are assembled with precision and sure to please. 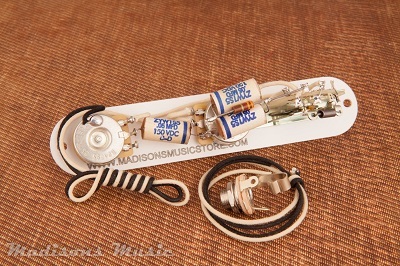 This is a great way to enhance your tone using one of Madison's reproduction tone capacitors.